ECEFast presents a new range of data logging thermometers from Lutron. Designed to deliver a new and straightforward logging and analysis solution intuitive to any user of digital cameras or smart phones, the Lutron TM947SD thermometers are part of a series of handheld instruments for environmental parameters with data logging to an SD card for simple exporting and sharing of data. 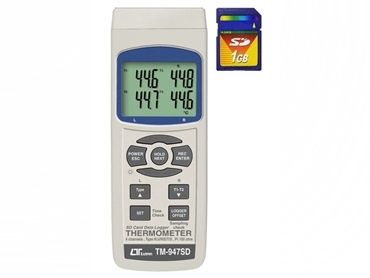 Lutron TM947SD logging thermometers cater for six thermocouple types and Pt100 in addition to four inputs via standard miniature thermocouple connectors and audio jacks.